Our brass trio recently returned from a trip to Lubbock, TX where we performed at the annual Big 12 Area Universities Trombone Conference. In addition to our performance at the conference, we also spent a day performing for high school students in Mesquite, TX, which is near Dallas. Although we were only gone for a few days, we managed to fit quite a bit of performing (and driving!) into a small amount of time. We departed on Thursday afternoon after a brief rehearsal – in fact this was the first time our group had rehearsed since the holidays. Since things were in good shape when we left them in December, and because we had all continued to practice our parts over the break, we found that the program was generally still in good shape. We spent Thursday night in Dallas, which is about 4.5 hours from Monroe. On Friday morning we performed an abbreviated version of our conference program for two large high schools (4A and 5A) in Mesquite – John Horn High School and West Mesquite High School. See the picture below for a view of us performing on the West Mesquite H.S. stage, complete with scenery from their upcoming production of Man of La Mancha. These schools have very fine band programs, and it was a pleasure to perform for them. After grabbing a quick bite, we departed Mesquite for Lubbock, about 5.5 hours away. We arrived in Lubbock a little after 7:00pm, and after dinner called it a night! Saturday we spent mostly resting at the hotel and at the conference on the Texas Tech campus. 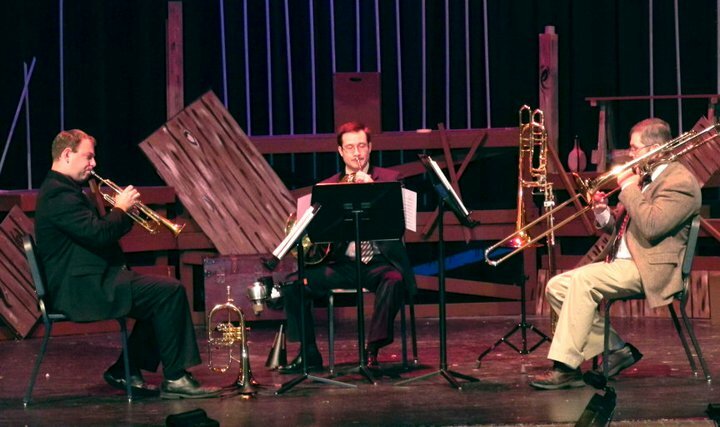 This was the first trombone conference I’ve attended, and I was very impressed with the quality of the performers as well as the overall organization of the event. 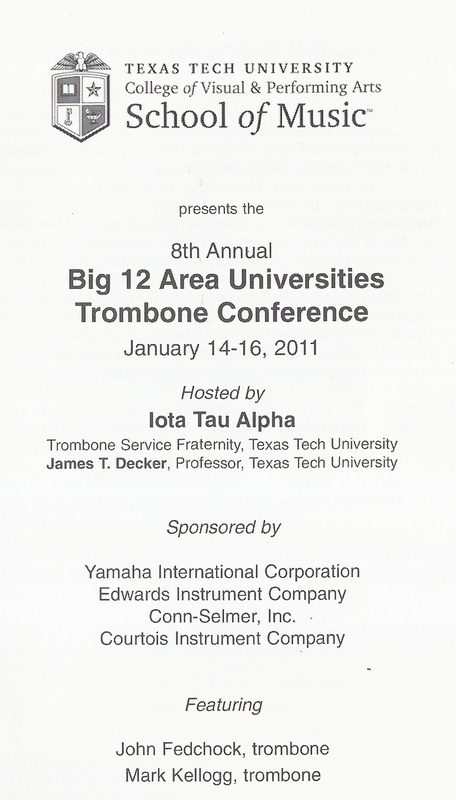 Jim Decker, Assistant Professor of Trombone at Texas Tech, deserves congratulations and a big thank you for putting on a very successful event. Our brass trio was scheduled to perform last on the program that evening, so we had plenty of time to warm-up, relax, and otherwise mentally prepare for the concert. 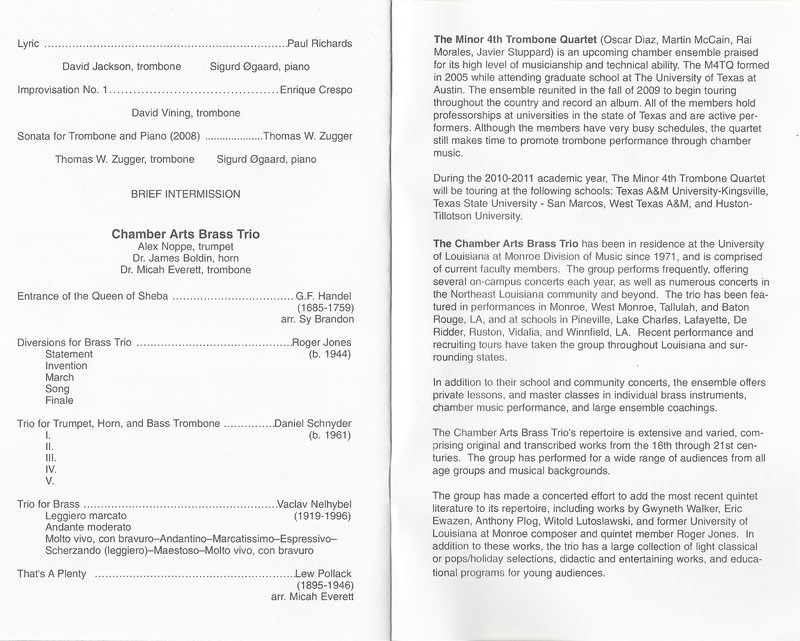 The concert featured both soloists and chamber ensembles, and was approximately 2.5 hours long (!) We ended up deleting one piece from the program (Nelhybel) in order to save some time, but the concert still finished around 10:00pm. The performance went well, and although the audience had somewhat diminished by the end of the concert, those who were there seemed to enjoy our program. Now comes the fun part – we departed Lubbock that night, arriving in Fort Worth around 3:30am on Sunday morning. We caught a few hours of sleep, then made the return trip from Fort Worth to Monroe on Sunday. All in all, it was a successful trip, but I’m glad to be back home and into a more regular routine of teaching and practicing.